We’ve already covered two educational games about diabetes in the US (here and here), so here is one in the UK. 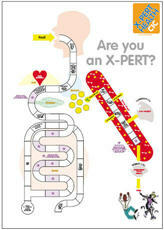 X-Pert Health uses their own game Are You an X-Pert? to drill diabetes patients as part of their six week educational seminar. It’s roll and move, but probably a nice ending to a long and serious educational process.